William B. Eerdmans Publishing Company, 9780802804570, 234pp. "But I don't wanna go to church " Marva Dawn has often heard that cry--and not only from children. "What a sad commentary it is on North American spirituality," she writes, "that the delight of 'keeping the Sabbath day' has degenerated into the routine and drudgery--even the downright oppressiveness--of 'going to church.'" According to Dawn, the phrase "going to church" both reveals and promotes bad theology: it suggests that the church is a static place when in fact the church is the people of God. The regular gathering together of God's people for worship is important--it enables them to be church in the world--but the act of worship is only a small part of observing the Sabbath. This refreshing book invites the reader to experience the wholeness and joy that come from observing God's order for life--a rhythm of working six days and setting apart one day for rest, worship, festivity, and relationships. Dawn develops a four-part pattern for keeping the Sabbath: (1)ceasing--not only from work but also from productivity, anxiety, worry, possessiveness, and so on; (2) resting-- of the body as well as the mind, emotions, and spirit--a wholistic rest; (3) embracing--deliberately taking hold of Christian values, of our calling in life, of the wholeness God offers us; (4) feasting--celebrating God and his goodness in individual and corporate worship as well as feasting with beauty, music, food, affection, and social interaction. Combining sound biblical theology and research into Jewish traditions with many practical suggestions, Keeping the Sabbath Wholly offers a healthy balance between head and heart: the book shows how theological insights can undergird daily life and practice, and it gives the reader both motivation and methods for enjoying a special holy day. 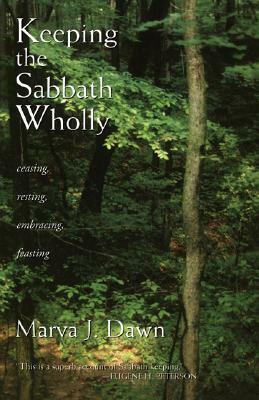 Dawn's work-- unpretentiously eloquent, refreshingly personal in tone, and rich with inspiring example--promotes the discipline of Sabbath-keeping not as a legalistic duty but as the way to freedom, delight, and joy. Christians and Jews, pastors and laypeople, individuals and small groups--all will benefit greatly from reading and discussing the book and putting its ideas into practice.